Un equipo de científicos en el que participa un docente del Instituto Balseiro desarrolló un novedoso método que permite generar nuevas formas de imágenes a partir de resonancia magnética nuclear (RMN). Así, los investigadores lograron mapear información morfológica de sistemas químicos y biológicos a una escala menor a la tradicional. El trabajo fue publicado en una de las revistas del grupo Nature, “Scientific Reports”. This entry was posted in Press and tagged diffusion, histology, MRI, NMR, science, Spinal Cord. Nuclear magnetic resonance is a powerful tool for probing the structures of chemical and biological systems. Combined with field gradients it leads to NMR imaging (MRI), a widespread tool in non-invasive examinations. 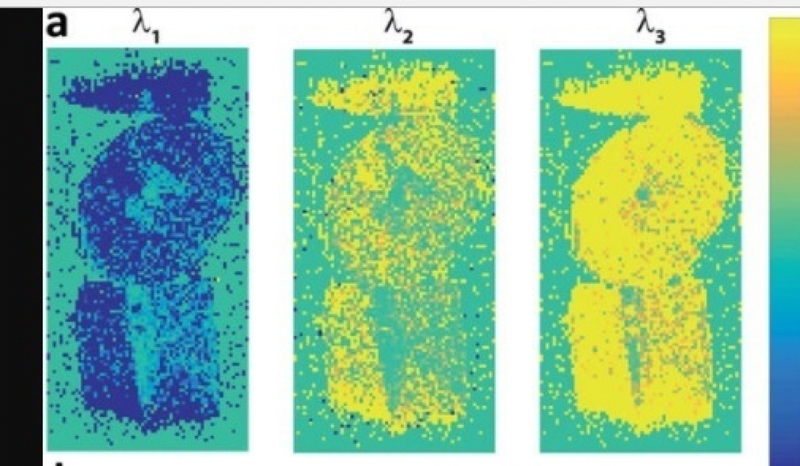 Sensitivity usually limits MRI’s spatial resolution to tens of micrometers, but other sources of information like those delivered by constrained diffusion processes, enable one extract morphological information down to micron and sub-micron scales. We report here on a new method that also exploits diffusion – isotropic or anisotropic– to sense morphological parameters in the nm-mm range, based on distributions of susceptibility-induced magnetic field gradients. A theoretical framework is developed to define this source of information, leading to the proposition of internal gradient-distribution tensors. Gradient-based spin-echo sequences are designed to measure these new observables. 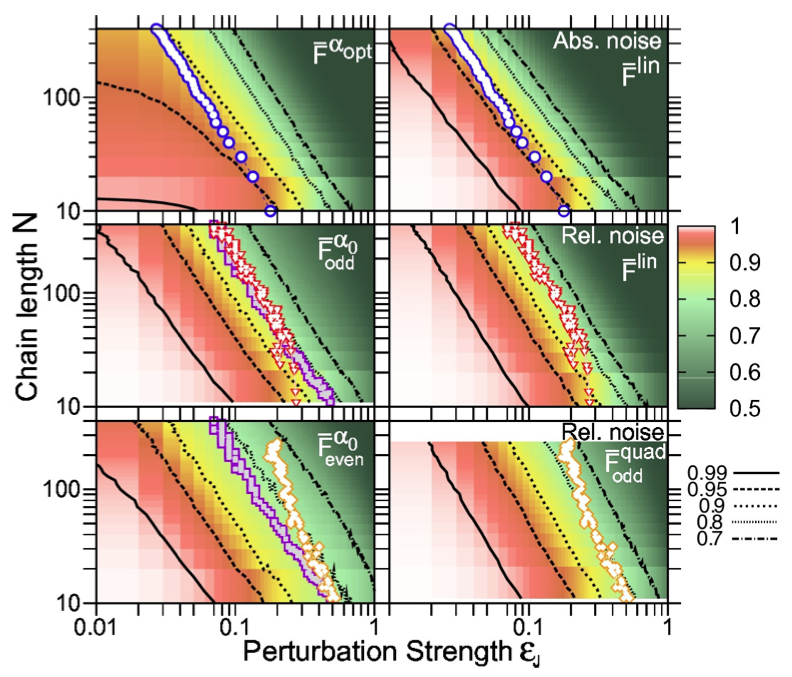 These methods can be used to map orientations even when dealing with unconstrained diffusion, as is here demonstrated with studies of structured systems, including tissues. 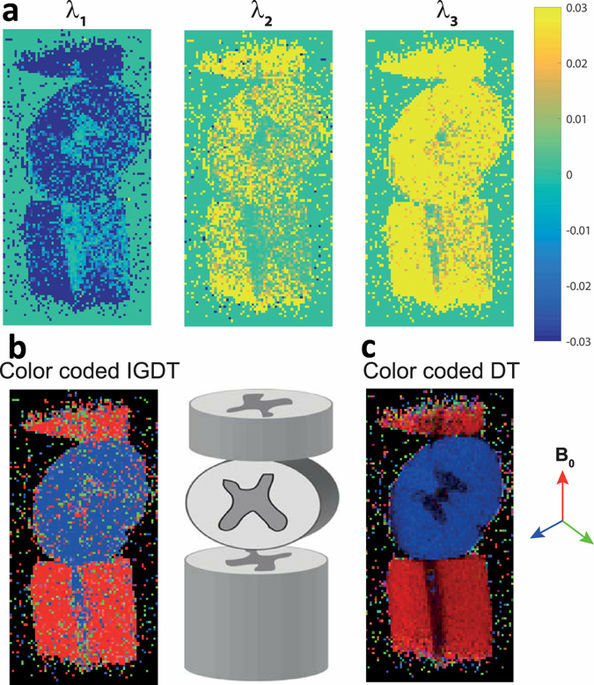 Mapping IGDT in biological tissues. (a) IGDT eigenvalues observed for a spinal cord specimen, examined in a 10 mm NMR tube filled with Fluorinert® (cartoon in center exemplifies this model phantom). (b) Color-coded orientation maps generated from the directions of the first eigenvector (the one with lowest eigenvalue) with respect to the main magnetic field [red: z-axis (up-down), blue: x-axis (in-out), green: y-axis (left-right)]. The vector magnitude was weighted with a fractional anisotropy to highlight its orientation. 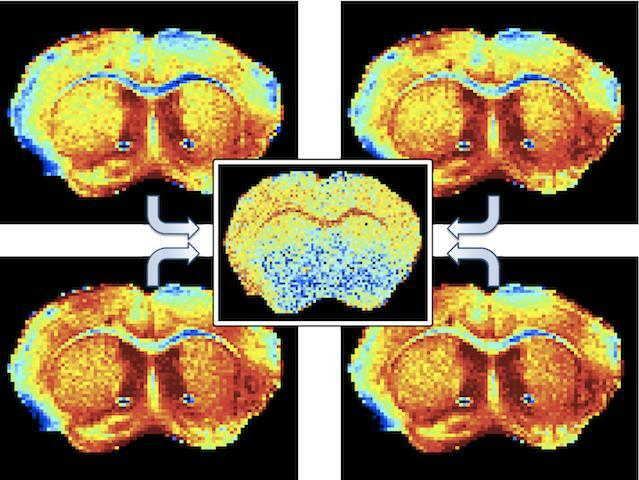 Parameters for the NOGSE MRI measurements were: TR/TE = 4000/50 ms, resolution = 156 × 156 × 1000 μm3, six pairs of opposing-gradient NOGSE encodings according to the orientations given in Fig. 3, NA = 4, G = 35 G/cm, total number of NOGSE oscillations of ten, total NOGSE gradient modulation time =20 ms. A T 2~50–60 ms was measured in these white matter experiments, and the shortest delay x was 140 μs. (c) Microscopic DTI tensor determined from the sNOGSE amplitude modulation Δβ S is shown for comparison to demonstrate the consistency of the orientations. EPI sequences were used for collecting all images, the typical SNR was >35 at its lowest. A full set of measurements took 13 minutes to complete. This entry was posted in Publications and tagged decoherence, diffusion processes, dynamical decoupling noise spectroscopy, Magnetic Resonance Imaging, magnetic resonance spectroscopy, MRI, NMR, NOGSE, noise spectroscopy, research, science, selective dynamical decoupling, tissue microstructure. Quantum-mechanical systems retain their properties so long as the phase of quantum superpositions evolve stably over time. Contact with an environment can disrupt this phase evolution. But for environments that do not exchange energy with the quantum system, strategies exist where the controlled driving of the system can recover or maintain the quantum phase. This Colloquium surveys the host of techniques that are available to “refocus” the phase when disturbed by various forms of classical or quantum environment. While the first such techniques were developed long ago, ideas from quantum information theory have introduced new strategies for accomplishing this goal. This entry was posted in Publications and tagged computer, Condensed matter, high fidelity, Physical sciences, quantum computation, quantum information, quantum information processing, quantum physics, quantum science, research, science. New J. Phys. 16, 065021 (2014). We propose a method of optimally controlling the tradeoff of speed and fidelity of state transfer through a noisy quantum channel spin-chain. This process is treated as qubit state-transfer through a fermionic bath. We show that dynamical modulation of the boundary-qubits levels can ensure state transfer with the best tradeoff of speed and fidelity. This is achievable by dynamically optimizing the transmission spectrum of the channel. The resulting optimal control is robust against both static and fluctuating noise in the channelʼs spin–spin couplings. It may also facilitate transfer in the presence of diagonal disorder on site energy noise in the channel. via Optimized dynamical control of state transfer through noisy spin chains – Abstract – New Journal of Physics – IOPscience. Top inset: Spin-channel for state transfer with boundary-controlled couplings. 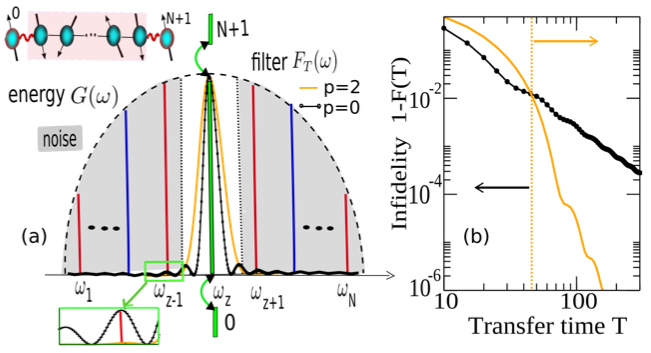 Boundary-controlled spin chain mapped to a non-interacting spinless fermions system. The two boundary spins 0 and N+1 are resonantly coupled to the chain by the fermionic-mode z with a coupling strength J_z*α(t). (a) Spectrum of the effective fermionic system (rectangular bars) which interacts with the bath-modes k (red-even k and blue-odd k vertical lines) with strengths J ̃_k* α(t). Dashed contour: noise spectrum described by the Wigner-semicircle (maximal-disorder) lineshape with a central gap around ω_z. In the central gap, the optimal spectral-filters F_T(ω) generated by dynamical boundary-control with α_p(t) (p = 0 (black dotted), p = 2 (orange thin)) are shown. Bottom inset: a zoom of the tails of the filter spectrum that protect the state transfer against a general noisy bath with a central gap. (b) Infidelity as a function of transfer time T under optimal control (filter) with p = 0 (black dotted) and p = 2 (orange thin). This entry was posted in Publications and tagged decoherence, disorder, dynamical decoupling, optimal control, Perfect state transfer, quantum computation, quantum control, quantum information processing, quantum network, quantum physics, quantum state transfer, research, science, spin dynamics, spin-chains, spin-chains engineering, state transfer.